MOSCOW, December 7. /TASS/. 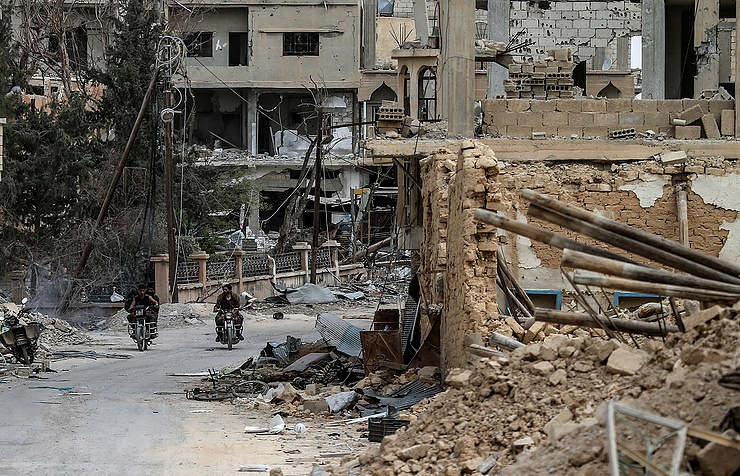 Bomb disposal specialists from Russia’s international mine-clearing center have started combing the eastern part of Syria’s Aleppo to clear it of mines and unexploded ordnance, the Rossiya-24 round-the-clock television news channel said. The commander of the mine-clearing group, Ivan Gromov, told the channel in an interview multi-storey buildings in the area were many, so the operation will be very time-consuming. “We spend much time on examining every tiny wire, because the effects of touching it are anyone’s guess,” he explained. The TV channel also showed Russian bomb disposal specialists in action using specially trained dogs. According to the report, the militants planted mostly makeshift bombs all over the city. The first group of Russian sappers arrived at Hmeymim airbase in Syria on December 3. The Defense Ministry said it was sending the most experienced specialists with a previous experience of such operations, including those held in Palmyra. The detachment includes a group of special dogs and their handlers. Russia’s General Staff said that 200 servicemen and 50 pieces of military equipment will be taking part in the mine clearance operations. Earlier, Russian sappers demined Palmyra, which was recaptured from the Islamic State (a terrorist group outlawed in Russia) last March. Russian military personnel inspected more than 2,500 buildings and structures and rendered harmless about 17,500 explosive items. Russia’s center for the reconciliation of warring factions in Syria has said Syrian government troops over the past 24 hours have regained from militants another ten residential areas in the eastern part of Aleppo, thus taking the number of quarters freed from terrorists to 45.